Congratulations to @city__sparrow, the giveaway winner! 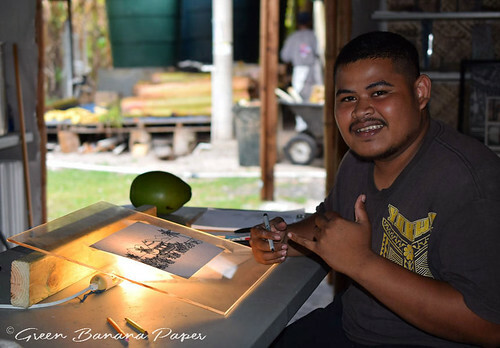 American expat Matt Simpson of Green Banana Paper in Kosrae, Micronesia has launched an innovative company in which banana tree trunks that would otherwise be discarded after harvest are recycled to make durable, vegan paper wallets, artist paper and more. 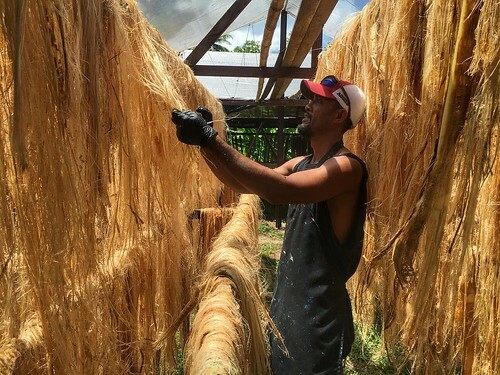 The story is a fascinating one and my hat is off to Matt, originally a volunteer school teacher in Kosrae, for recognizing a way to improve the lives of island residents by creating jobs and sustainable export products. 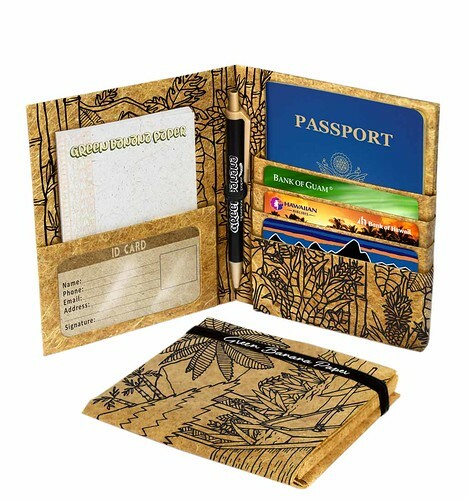 Have a look at this fun-to-watch, short video that shows the labor-intensive process of making eco-friendly wallets from tough fibers that are stripped by hand from within banana tree trunks. You see, unlike most fruit trees, banana trees produce fruit only once and then must be chopped down. 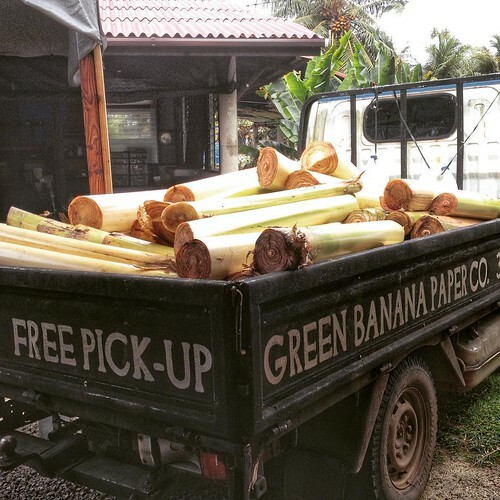 Usually they are left in the jungle, but thanks to Green Banana Paper, more than 75 Kosrae farmers now earn extra income by selling their waste trunks to the company. Banana fiber has been used for thousands of years for rope making and weaving, but it was Matt had the idea to launch the tiny industry in 2014 by teaching himself, and an initial handful of local workers, the process of making paper via Google, YouTube, books and lots of trial and error. 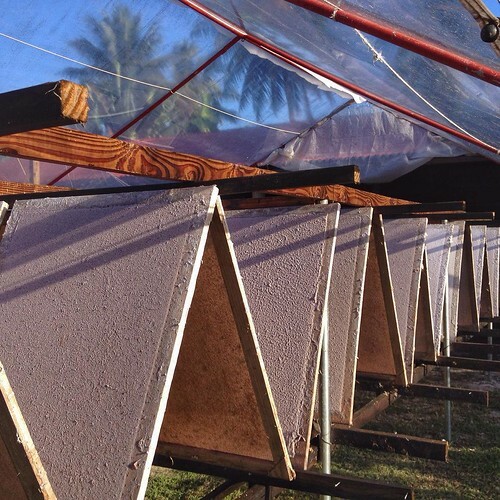 It is obvious he has put an immense amount of determination and passion into the project, and has carefully thought out the most ecologically sound way of producing banana paper. "Green Banana Paper is striving toward a closed loop manufacturing process. The waste from the banana trees is put into a compost pile until it decomposes enough to fertilize our small fruit farm. Off-cuts and paper scraps are recycled and transformed back into the original fibres with almost zero waste." 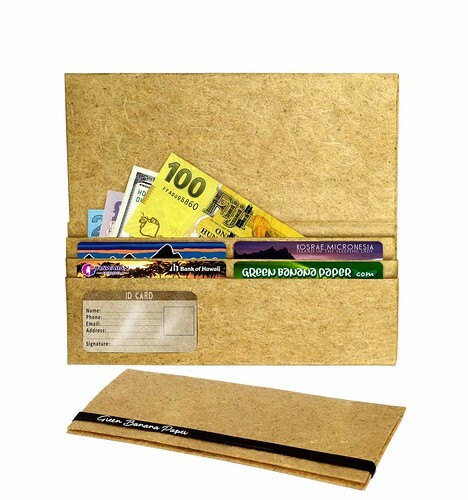 Like leather, but without the cruelty, banana paper wallets are naturally water, fire and tear resistant. A thin coating of wax is applied to the outside to protect against sweat, spills or rain. With thoughtful use, one can expect a wallet to last for years. The informative Green Banana Paper press page details the steps of the process: "It begins with our local farmers, then tree collection, fiber extraction, drying, cutting, boiling, washing, pulping, papermaking, die-cutting, scoring, printing, adding elastic/ID window, folding, gluing, sewing, waxing, grading and packaging. Over the course of 1-2 weeks, more than 12 people must put a total of 5-6 hours of hard work into each and every wallet." 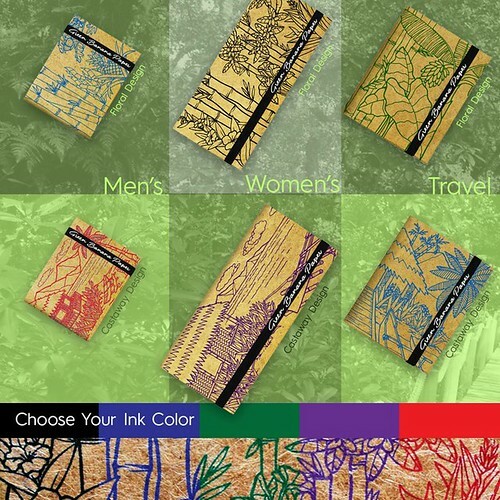 With the success of its Kickstarter campaign that launched less than a week ago to create Green Banana Paper awareness - it has already met its target goal, but continues through March 31; you have not missed out! - the company will continue to grow by hiring more employees, recycling more banana trees and expanding its product line. 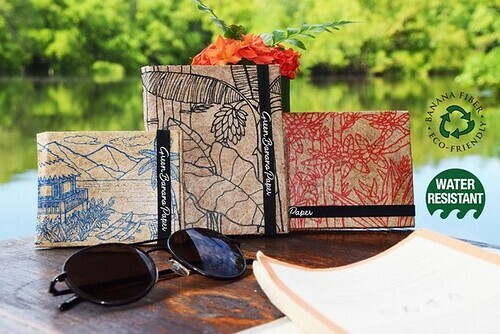 Giveaway details: One international winner will receive a handmade banana paper wallet in his or her choice of the Floral or Castaway screen printed design and ink color shown below or a blank wallet - particularly nice for those who prefer a clean, leather-look or for artists who wish to apply an original design. Delivery will be mid-April when the Kickstarter campaign has ended. The giveaway is also underway on Instagram. Enter at one or both places by the end of Saturday, February 25, 2017. One person from the combined locations will be chosen at random and announced at the top of this post and on the Instagram giveaway photo. Good luck! Visit Green Banana Paper; also on Kickstarter, Facebook, Instagram and Twitter. Note: You might be wondering where remote Micronesia is located... a region of more than 600 islands in the western Pacific Ocean, it is roughly a seven hour flight from Hawaii and six hours north of Sydney. Awesome wallets! Was JUST looking for a new one when this came up! Thank you so much for covering this local industry! One note, Micronesia is a region, not a nation. Just got your mail-update/newsletter in my mailbox and just read the wonderfull story on this green banana paper-making. I read a list once of all the things a banana can do and now look it can even turn it can turn into a wallet. Pretty cleaver that banana. I have never seen anything like this. Just wonderful!! Such a cool wallet. A creative mind is an amazing tool. You have that tool. I am constantly in awh of the creative use of things people discard. Just4jackiesstuff2016 at Gmail dot com. Good luck to all who enter. What a fantastic product!!! Would love to get several--they would make nice gifts. Love these. I'm all for animal free products. Beautiful at the same time. Amazing and beautiful too. 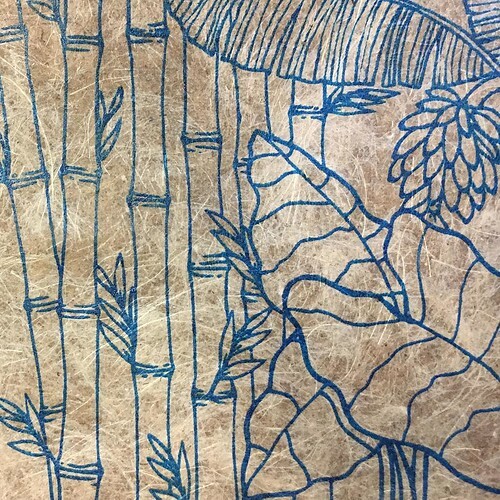 I am eager to try this banana paper in my art projects. Winning a wallet would be the icing on the cake. So clever! 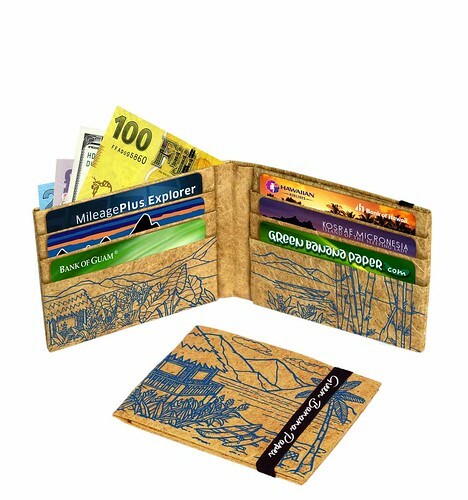 Love this idea & the beautiful wallets. Kudos to the creators - Wonderful recycle idea and good for the artistic soul! These are stunning works or art as well as being useful and good for the environment! Especially like the green men's wallet. Fantastic idea. We lived in Micronesia about 40 years ago - loved it!! Would love to own one of the banana wallets. Those are some amazing wallets! And I need a new one too. 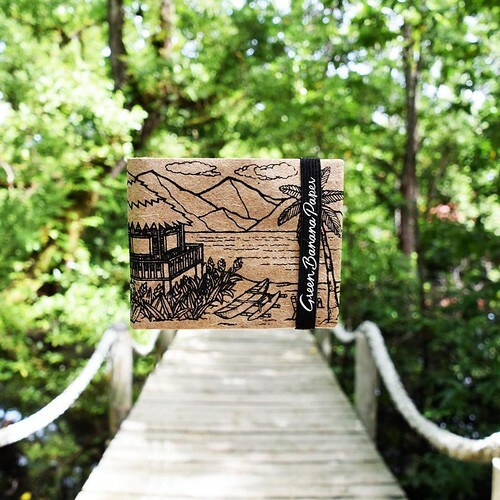 What a beautiful and innovative way to create a gorgeous product in a sustaining manner! This is a fantastic concept! Love it! The Pacific needs more of these sustainable, ethical, and environmentally friendly approaches to business. 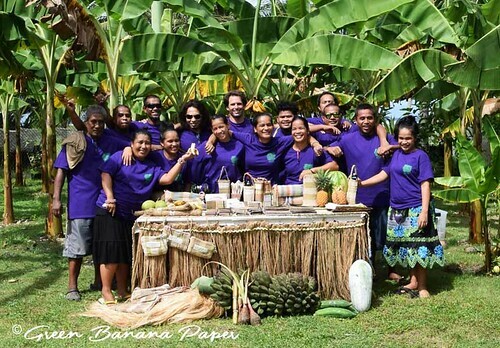 I hope Green Banana Paper will inspire more budding entrepreneurs from the Pacific to be more environmentally conscious when developing their products. I love these wallets! So amazing! Beautiful, ingenious and exciting. Brilliant idea and great artwork. Impressive. Just seeing this information on a sleepless night. May God bless your efforts and many through them! Oh my god they are amazing! Simple, original and useful. Glad I've descovered them.